Are you sick of raiding for the hundredth time on the off chance you might get loot? Is there no loot left for you in the game, but you're stuck running the same instance with the guild that got you all your loot? Well, look no further! 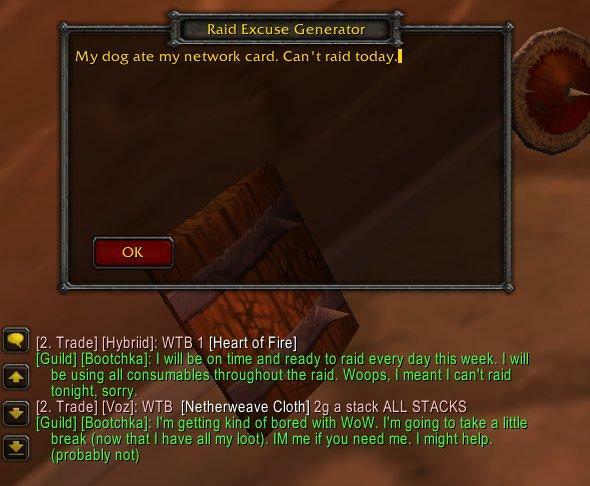 Raid Excuse Generator will save you the trouble of explaining to your guild or raid why you can't or won't make it today. This addon will generate an excuse for you with one simple command. /eguild will generate an excuse and send it to guild chat. /egraid will generate an excuse and send it to raid chat. /eginput will allow you to add your own personal excuses. /egclear will clear your personal excuses leaving you with the default. /eghelp will display the list of commands. Typing /eguild or /egraid followed by a number (e.g. /eguild 5) will allow you to choose a specific excuse to send. Typing /eglist displays a numbered list of excuses. Have fun doing whatever you do when you're not raiding in WoW! 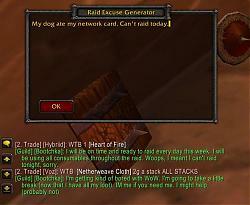 WARNING: Raid Excuse Generator may be less effective if you choose to stay online doing dailies or PVPing on the same character after generating excuse. Excuses now save across sessions. Excuses are still randomly chosen by default, but you can now specify a specific excuse to send. Future changes: /eglist will no longer be an editbox, considering you can't make any changes to the excuse list from there anyway. Convert /eglist to a scrollable list of buttons, enabling users to click an excuse to choose to send to guild or raid in addition to command line /eguild # or /eraid #. Assuming I learn enough that it's not a big headache I will try to convert the xml into lua. Or you could, you know, just not join a raiding guild? The excuses might be funny, but the intentions are ill.
ROFL @ The screenshot. OMG I almost died of laughter. Thanks for your feedback so far everyone. I'm new to lua and obviously making addons for WoW. Right now I'm trying to make it so you can put in your own excuses in game and have them saved to a variable per character. My programming experience was C++ about 5 years ago, so I'm a little rusty. It almost works, but I'm probably doing it in the most inelegant way possible. Your idea to mix and match pieces of phrases to create new excuses is a good one VagrantEsha. I'll have to look up CreateFrame(), among many other things, but I think looking at the popular PirateSpeak addon would help me figure out how to do that. I'm not an idiot. I'm just harmlessly psychotic. Loot day? Loot day? Fabulous! It's always good to see that I'm not one of perhaps three people alive who has a sense of humour and isn't obsessed with raiding every other bloody hour. Sometimes I do wonder. I have a couple of suggestions though, I'd recommend using CreateFrame() so that you don't have to include that XML file, XML files aren't needed today for loads/event handlers, they're fairly obsolete. You can look at WoW Wiki to see how CreateFrame() works, or I could give you a few pointers if you'd like. Also, put 'local ' before each of your functions, that way you're not cluttering up the global namespace and other developers will love you for more than just the humour. Other than that, it's a pretty funny idea. = "I'm unable to raid today, I'm"
Then you could form the three, adding spaces as necessary. Then we'd see things like... "I'm too preoccupied to raid today, as I'm flossing the neighbour's alsation". Just a thought dump. Feel free to ignore any and all of my post, if y'like. Last edited by VagrantEsha : 07-23-08 at 08:20 AM.